This is the ability to control one’s environment, rather than have it control you, as is so often the case. Self-determination, choice, and the power to decide your response to particular stimulus, conditions and circumstances. Covey calls this ‘the habit of personal leadership’ as in leading oneself towards what you consider to be your aims. By developing the habit of concentrating on relevant activities, you will build a platform to avoid distractions and become more productive and successful. 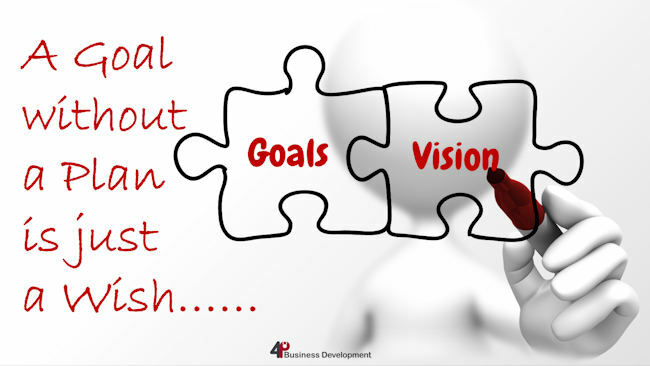 When I first meet with a new client, one of the first things I ask is, “do you have a business plan?” I can honestly say that in the many years I have spent coaching business owners, very rarely is the answer yes. If they do have a plan, what does it look like and does it directly relate to your personal and business goals? This invariably gets another negative response! So why is it that so many people who run their own business do not set goals and then have a plan to work towards achieving those goals? A goal setting plan creates a bridge between today’s dream and tomorrow’s reality. Without a plan of the what, when, why, how and who, goals alone will not get you to your destination. Once you have your goals start your plan today! Another reason that some business owners fail to work towards their goals is the confusion over time management. Identifying what are the next steps and in what order to complete tasks. What tasks you should complete personally and what tasks should you avoid and/or delegate. 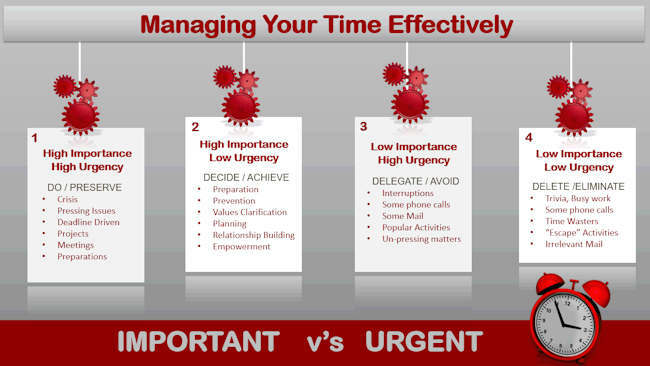 The two main criteria on which you should evaluate tasks are importance and urgency. These are the most pressing tasks you should focus on immediately. These are the crises that will erupt if you don’t. The most urgent meetings or deadlines fall into this category. When we do fire-fighting, it’s all relating to stuff in this quadrant. These are the things that matter in the long-term but will yield no tangible benefits immediately. They are things we know we need to get done and will have an impact on the business if they aren’t completed. It’s having a lunch with a significant contact or client, relationship-building and long-term planning. These tasks are the biggest reason you are not more successful in the long-term! They clog up your time today, but when you look back at these things, you will have to admit they were a waste of time. These are interruptions that happen, such as unnecessary phone calls, poorly thought-out meetings that soak up hours of your time, activities which you believe in the moment that you must do, but if you stopped to really think about these tasks, you would realise they aren’t that important. These are the things you do when you’re tired and need a break. It’s checking Facebook and Twitter during the day, because we think we might miss something. It might be mindlessly eating potato chips, even though we’re not hungry. You will be amazed how much time you spend in this quadrant wasting time and avoiding the most important task that will make a difference to your business. To successfully use this method of planning, you must have a very clear understanding of what is important to you and what both your long-term personal and business goals are. If you’d like some help setting SMART goals and taking the steps you need to move your business toward them, do give me a call on 01280 700405 or click here to ping me an email and let’s see how I can help you. Networking is a great way to grow your business, but it can be scary at first! A lot of people are afraid of networking groups, but the truth is, we are all natural networkers; we do it every day with our family, friends and colleagues. As we chat, add value and connect, we hope to uncover opportunities and increase our knowledge of other businesses so we can plug them into other contacts we may have and generate potential sales leads for our own business. Even in today’s technology driven marketing environment, over 80% of new business is gained through formal or informal networks online and oﬄine through the oldest marketing tool, word of mouth. So choosing not to include networking as an integral part of your marketing strategy cuts you off from a vital and vibrant source of new business. Networking is deﬁned as “developing an extended group of people with similar interests or concerns who can interact and remain in contact for mutual assistance or support”. Something to note is that it’s important to develop these contacts well before you need them. It’s about cultivating positive relationships which are built on giving rather than taking. 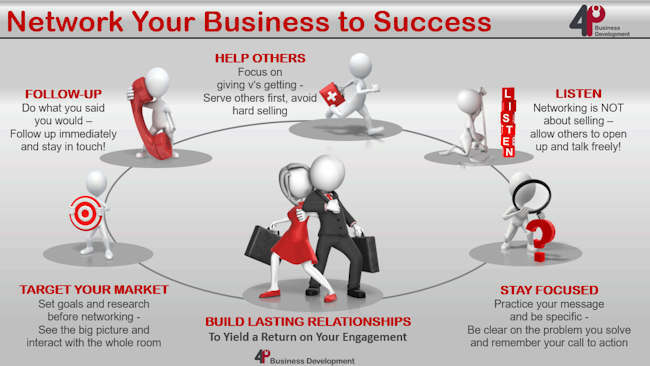 As well as identifying new business opportunities, networking allows you to share ideas, experience and good practice. You can meet inspirational role models, overcome isolation by meeting new people as being in business for yourself can be lonely at times, or maybe ﬁnd new suppliers as well as developing relationships already started. It is easy to become isolated and lose touch with what is happening around you, especially in the early days of building a business. For me, the key to successful networking is being ready to serve ﬁrst, give rather than take, follow up professionally and always be willing to help others by introducing people and initiating relationships. When it’s such a low cost, high reward activity, it amazes me how many business owners ﬁnd themselves committing one of the 7 Networking Sins without even realising it. Failure to set goals and research before the meeting. Lack of business cards, or being dressed inappropriately for your brand using poor body language. Hiding in the shadows, avoiding eye contact and only talking to people you already know. Failure in seeing the bigger picture, only seeing the people in the room and not understanding that everyone has a wider network behind them and remembering to celebrate the wins of others in the room. Selling hard without permission, not serving others ﬁrst. Failure in being speciﬁc and clear on the pain that you solve for people, forgetting your target market and no offer or call to action. Failure to help generate business through referrals for others, lack of ‘permission’ database to stay in touch and no processes for keeping the conversation going. Relationships matter. Most people have access to at least 250 contacts and your reputation needs to speak for itself. By going into networking with a ‘giving’ mindset, you’re creating an opportunity for people to really get to know you. That’s how you leave a positive and lasting impression, and that’s why people will want to help you in return. That’s what networking (and life) is all about after all! Now, don’t get stuck in a networking rut. Keep looking out for new and varied events to go to; clubs, associations, meetings, seminars, conferences, presentations, breakfast brieﬁngs, lunches, exhibitions. Your aim is to increase your visibility, so present yourself as your brand and show people a consistent avatar. What I mean by that is that your online presence (website – Facebook – Twitter page etc) needs to match your offline presence (your business cards and yourself in person). For example, I use the same photo on my Facebook proﬁle, LinkedIn page and on my business cards, and I regularly get people recognising me who I have never met, but who already feel a connection with me. Always be positive – sounds like common sense, but you would be amazed how many people I meet when networking who look like they got dragged there! By having an open ‘can do’ attitude and having the belief in giving and sharing, as well as offering assistance, your reputation will soon grow, and people will be attracted to your energy and personality. Develop the ability to ‘Schmooze’ – being able to talk to anyone is a valuable skill in its own right and essential in business. Being able to initiate a conversation means you are more likely come into contact with people who may turn out to be valuable connections. Have a few phrases such as, “How did you get started in … ?”, “What do you particularly need to help you succeed?” and, “How would I recognise your ideal customer if I met them?” up your sleeve. Develop your listening skills – networking is not about selling, it is about listening to the other person, allowing others to open up and talk freely. Take an interest in what’s said and encourage them by using positive body language and subtle mirroring techniques to develop rapport. Remember your business cards – only 25% of business people have a card that is up to date and gives the receiver precious information about them. Ensure it has all your contact information, including all your social media addresses. Connection is the goal after all. Plus use both sides! It’s vital to be organised – keep a database of everyone you know and meet, using memory joggers and any mutual contacts for future reference. Invest in your own Contact Relationship Management (CRM) software to make this easier. At most structured events you will get to present to the room with (up to) a one-minute presentation and you need to make the most of this opportunity. And ﬁnally for today, lets ﬁnish by making sure you always set your intentions. You can do this in a number of ways. Set your intention to go Networking right now, put dates in your diary and commit to go. When you arrive at all those meetings, know your minimum success outcome, what you have to come away with to make that investment of your time worthwhile. 01280 700405 or click here to send me an email enquiry and let’s talk. Positioning is to do with the place your brand occupies in the mind of your customers! When did your last review your Positioning, marketing activity, PR, customer experience and client retention? Positioning is how you differentiate your product or service from that of your competitors and determine which market niche to fill. Do you believe in your product? And are you consistent and regular in the way you promote it? Well, unless you are, the odds of succeeding are substantially reduced. 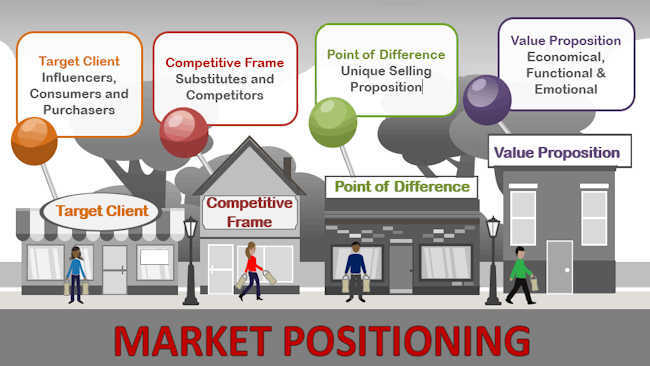 Positioning specifically refers to the place that a brand occupies in the mind of your clients and how it is distinguished from the products or services from your competitors. In order to position your products, it is essential for you to emphasise the distinguishing features of your brand. Get it right first time as once a brand has achieved a strong position in the market, it can become difficult to reposition it. Remember, you should not be thinking “I need a great logo” or “I need a new website and will base all my marketing collateral around that”. That’s what’s called ‘away from’ thinking. No, what I help you to do is change your mindset to ‘towards’ so you think this way instead: “I want more customers” or “I want to increase my profit margin” or even “I want everyone to recognise my company name”. I’ll ask you those bloody difficult questions which will enable you to make the best decisions about your target clients, the niche you want to position your products and services in, what your USP is and then work out your brand and the ‘things’ that are part of it. If you feel you’d like to talk to me about coaching and mentoring for you and your business and assistance with proper positioning, give me a call on 01280 700405 or click here to ping over an email enquiryand let’s talk.